Congratulations to Imre Bartos, whose article "A new cosmic messenger" has been picked as one of Physics World's five favourite features of 2018. Taken from the January 2018 issue of Physics World. Members of the Institute of Physics can enjoy the full issue via the Physics World app. The first observation of gravitational waves from two merging neutron stars that was recently made by the LIGO and Virgo detectors has – along with data from telescopes across the globe and in space – kicked off a new era in multimessenger astronomy. Imre Bartos describes this watershed moment, which crowned decades of research and will shape the future of observational astronomy. It was almost over. There was only one week to go before the Advanced LIGO and Virgo detectors would complete their observational run, and be shutdown for a year. Indeed, many of my colleagues from the LIGO–Virgo team were already on vacation, while I was awaiting relatives who were visiting. Then my phone buzzed. An automated text message, which read “ALERT FROM GWHEN | New event: G298048 | Check your email!” prompted me to rush to my computer, to look at the signal in a LIGO database. When a flurry of agitated phone calls from collaborators followed, it became clear that a historic moment was unfolding. We observational astronomers needed to act quickly, and as our findings were still a secret, I couldn’t even tell my relatives, who had arrived in the middle of the excitement, why I would need to work. On 17 August 2017 the LIGO detectors in Louisiana and Washington detected gravitational waves from the collision of two neutron stars – ultracompact dead stars that weigh as much as our Sun, but are barely 20 km in diameter, roughly the size of Manhattan. Such an event had been anticipated for decades, but had never been observed until now. Within two seconds of the arrival of gravitational waves at LIGO, NASA’s Fermi Gamma-ray Space Telescope detected a short gamma-ray burst. This made it even clearer: the gravitational-wave detection – dubbed GW170817 – was not a false alarm, and observatories across the globe quickly needed to turn towards the direction of the collision, or the data would be lost forever. More than 70 telescopes and observatories around the globe and in space were rapidly notified, and were able to execute a co-ordinated survey of the merger and its aftermath, across the full electromagnetic spectrum – gamma-rays, X-rays, light, radio waves – and neutrinos. A new era in multimessenger astronomy had begun (figure 1). Neutron-star mergers may be the main source of heavy elements in the universe. 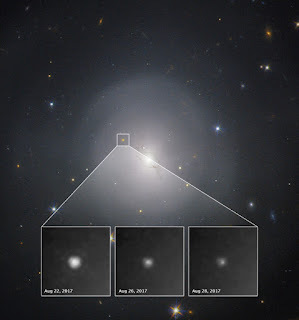 We have a new upper limit on the mass of neutron stars. The neutron stars in GW170817 orbited each other for billions of years before colliding. The colliding neutron stars created a gamma-ray burst. There’s something strange about the energetic jet.